For some people a career dealing with people and bringing out the positive, can be a bit overwhelming. For others this type of career is very fitting to their personality and their strengths. 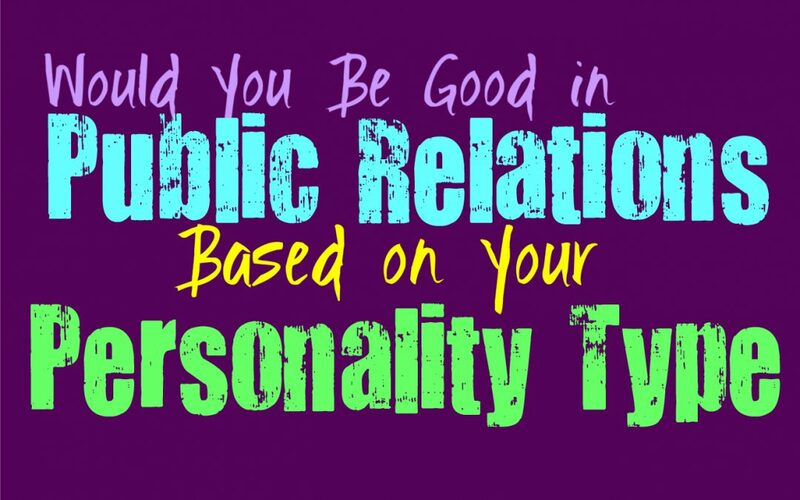 Here is how good you might be in a public relations career, based on your personality type. INFJs are often great at connecting with people and their sense of understanding towards others can be beneficial. INFJs actually are good at seeing the positive in a situation, even if this isn’t what stands out from their personality. If they need to the INFJ is often capable of finding their way around a struggle or mistake, and figuring out how to make it seem better. For the INFJ a career in public relationships might not be that rewarding or fulfilling, but that doesn’t mean they would not be good at it. They more mature and refined INFJ would definitely excel in this career, but most likely it wouldn’t be something that they truly enjoy unless they are doing it for a good cause of some sort. ENFJs are often excellent in PR careers, since it requires being able to understand people and create a bridge which expresses things in a positive light. ENFJs know how to create a great image which they can present to others, and so public relations is honestly a great career choice for them. They can often see how to present things in a way which makes something appear more positive and so they can fix certain mistakes rather well. For the ENFJ being able to really bring out the positive side of something is often a natural talent and to play mediator with someone who really needs that help. For the ENFJ public relations is definitely something they can do well, and being able to be good at something would definitely be fulfilling for them. INFPs aren’t often interested in having to create some sort of public image, and so a career in public relations would likely be unfulfilling for them. They enjoy being honest and don’t like having to pretend in order to gain a specific reaction. For the INFP being themselves and being sincere is important, and they don’t like having to present something in a way that deceives others in some way. INFPs can see the good in others but feeling like they need to only play on the positive in order to make people happy, isn’t right for them. A career in public relations would simply be difficult for the INFP to really swallow in most cases, unless they were doing it for a truly good cause. ENFPs are definitely good at seeing the positive in a situation and so they know how to bring that to light. ENFPs can often put a smoke screen up which distracts people from mistakes and draws them towards the good which is in front of them. If they found themselves drawn to this type of career they would certainly excel at it. The trouble is that ENFPs might become bored with having to create a public image, especially if they felt like it was for someone who did not really deserve it. For the ENFP they need something both fulfilling and uniquely challenging, and at the same time it would have to have an element of honesty and integrity. INTJs aren’t necessarily made for a career in public relations, mostly because of their blunt delivery. INTJs do know how to be strategic and take on a new approach in order to get things done efficiently. While they know how to work around any errors, they aren’t necessarily naturals when it comes to putting a positive spin on things. They are more realistic and upfront, and prefer to focus on getting things done without having to obsess over some sort of public image. While some INTJs might draw themselves towards learning how to perfect their PR abilities, they don’t naturally find themselves in this type of situation without a little extra effort and study. ENTJs are often good at pushing through and finding a way to put a spin on something the way they need to. ENTJs value efficiency and because of this they often push themselves to get things done the way they need to, no matter what that means. While they are blunt people who don’t normally search to find ways to deliver things in a more sensitive manner, that doesn’t mean they aren’t capable of it. When they find they might need to learn to up their PR skills, the ENTJ will figure out how to do it in a way which is effective for them and whoever they are working for. INTPs can sometimes overthink things which might make it difficult for them to handle a PR career. While they might be able to see the best approach, they have a tendency to overanalyze something and possibly second guess themselves. INTPs might be a bit nervous about public relations and having to create an image which others will respond to. This is something they likely have in them, but they might not feel entirely comfortable with. They will do their best to find the right approach, and will try to ensure that they can deliver an image which people will respond to, but it can be something which stresses them out a bit. ENTPs can often be great at public relations, especially since they are such outgoing and charming people. They often know how to distract from the negative and will find a way to make things seem a bit more positive. ENTPs are good at connecting with others when they need to, and can really use their charisma to get things done. While they might not always be the gentlest people, they are capable of it when they need to. If they are in a situation where they need to create some sort of public image, ENTPs are often surprisingly good at this. ISTJs are good at problem solving and being efficient and so they might not be bad in a PR career. For the ISTJ being honest is the best way to approach things, but they can often find a way to spin this truth in a way that people can appreciate and understand. For the ISTJ public relations careers aren’t as farfetched as people might think, especially since they are efficient people who work hard to be good at just about everything they do in life. ESTJs are hardworking people who do whatever it takes to get things done and so they can often succeed in a PR career. For the ESTJ this isn’t necessarily the best choice, since it requires having to put a positive spin when they prefer to just get things done their own way. Their ability to work around things helps the ESTJ find a way to put the right spin on something and to solve whatever mistakes they might make. While they don’t necessarily prefer a PR career, they can definitely be good at it if need be. ISFJs are naturally good at public relations and creating a positive spin for something that might not be so pleasant. They are good at being that bridge between people, and can really make a situation seem much better. They are compassionate people who understand others, and often know how to give them what they want. Their ability to look on the bright side, is often what makes ISFJs great in a public relations career. For the ISFJ it is often easy to bring out the good in others, and find a way to make people look at something the right way. ESFJs are very compassionate people who often understand others very well. Their ability to connect with people helps them to understand how to be great in a PR career. They can often be the person in the middle who can make others see things the way they really want them to. ESFJs have a natural ability to see what others want and so this helps them provide an image that people can appreciate and really connect with. These capabilities are definitely likely to help the ESFJ be truly great in a public relation career. ISTPs are actually capable of being good in a public relations career, especially if they are doing it for someone else. They might not enjoy being the one in the spotlight or giving speeches, but they can often create an image for someone else. ISTPs will use a sense of charm but also logic and reason in order to build the right approach for a proper public image. ISTPs know how to get themselves out of trouble, and so this is also something which can aid them in a PR career. ESTPs are often excellent in public relations careers, since they know how to put a positive spin on things but in a logical manner. They are strategic people who know how to problem solve and move forward in their lives. While they can sometimes be blunt people, ESTPs know how to be on their best behavior when they are under a microscope. Their ability to understand people and use their charm on those around them, ESTPs can definitely be great in a PR job if this is something they want to step into. ISFPs can certainly be good at public relations careers, since they are positive and charming people. While they are good at putting a positive spin on things, they might rather do this from the background instead of being the one in the spotlight. They can often be great in PR when they are doing it for someone else, and can build a truly positive image for those people. ISFPs know how to make things sound better and can really help someone create the image they need. ESFPs are often natural when it comes to public relations, since they are positive people who can often use their charisma to get things done. Their ability to connect with others and really look on the bright side is definitely a skill which helps them. ESFPs are social and friendly people, who enjoy being able to make others smile and bring out the good in them. For ESFPs a public relations career is definitely something they can excel in, and certainly is one of the more ideal careers for them.